"My Great Great Grandmother used to make this when I was young, and it has always been a favorite of my Atlanta and Alabama relatives! I learned how to make it from my Aunt Edith Russell, while visiting her in Atlanta in the mid-1990s!" Preheat oven to 350 degrees F (175 degrees C). Grease a 9x9-inch baking dish with about 1/2 tablespoon of butter. 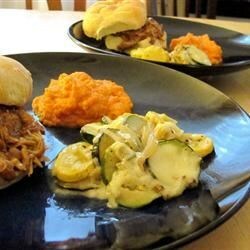 Melt remaining 1 tablespoon of butter in a large cast-iron skillet over medium heat, and cook the summer squash and zucchini until the squash pieces begin to brown, 10 to 15 minutes, stirring often. Sprinkle with salt and black pepper, and spread into the bottom of the prepared baking dish. Sprinkle with about 1/3 of the chopped onions. Mix together the white Cheddar cheese and yellow Cheddar cheese in a bowl until thoroughly combined, and sprinkle about 1/2 cup of the cheese mixture over the onions. Drizzle with about 1 tablespoon of the sweetened condensed milk. Repeat sprinkling cheese, onions, and condensed milk twice more, then top with remaining cheese mixture. Bake in the preheated oven until the casserole is golden brown and the onions are tender, about 30 minutes. See how to make a hearty squash casserole for a side or main. It is a nice alternative to cheesy hashbrowns, but it lacked a wow factor. This is one of my all time favorites! I actually use more butter and sweetened condensed milk than the "official" version calls for, but it is a matter of taste! Good, but I think next time I would mix the onions throughout. An easy way to eat vegetables that aren't my favorites other ways! I liked this a lot, very rich! One word to describe this recipe: DELICIOUS! It was very easy and very tasty and I will make it many many times! My boyfriend made this exactly as written and found it rather bland. I thought the onions overpowered the veggies and cheese. If we make this again, we will cut the onions in rings instead.